Very often people are hesitant about buying art for the fist time. Not only is there a hesitancy in entering a gallery premises but there is an overall sense of awe and apprehension when considering the entire process of buying art. Clients wonder if it is all right to purchase a single artwork, should they negotiate on the price or is it going to be embarrassing! Then there are questions about where should the buy from and would they be able to resell it when required. Also, there are doubts regarding how to go about buying art for the sake of starting a collection, should they consider it as a financial investment or should they only consider enhancing aesthetics from an interior decor perspective. One of the first things to do before buying art is to empower yourself by reading up on art, visiting local art galleries, meeting artists and other people who are actively involved in this field. Talk to artists, consultants and curators to get insights about the functioning of the art market and to also network with like-minded people. Find out about current trends, read about exhibitions and reviews, and try to get a sense of the art market, prices and resale options. 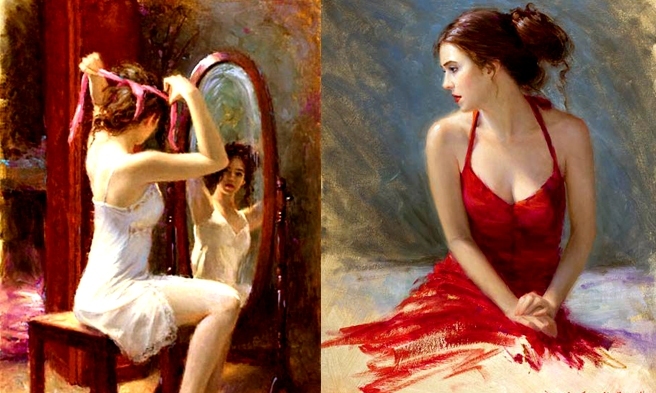 Look at images and artworks to get an idea about the kind of art that you prefer. Are you inclined towards traditional paintings, contemporary art or perhaps experimental art? It helps to be clear about what you enjoy and what kind of art engages you. Next find out about reputed galleries and dealers. Visit galleries to see how comfortable you feel while interacting with them. If you are planning to buy art from an online source, find out about safe and credible sites who deliver authentic works. Check with galleries if there is a buy back clause or if they will help you in reselling at a future date. Get familiar with provenance and authenticity and all the necessary precautions that you must take to ensure you buy an original artwork which is authentic. I find that it is also important to establish your reasons for buying art – is it to cover up a vacant wall or floor space, is it a part of your investment portfolio or do you want to start building an art collection? It helps in deciding the kind of art that you should buy and also in planning a budget for it. It is always a good idea to begin in a small way and put in only a small amount of money in the artwork initially. You could then see how you feel about the entire process, how the artwork engages you and how confident you feel about investing larger sums in art. Perhaps the most important criterion, allocate a budget for art and put in sufficient effort to stay within it. It is often easy to get carried away and spend much more than you had initially intended. Decide if you are going to spend small sums over a period of time or whether it is going to be a one-time investment for you. Do make sure that it is only a small percentage of your disposable income and not a portion of your primary investment portfolio. One of the major reasons why it is advised to buy art that you enjoy is that unlike any other asset class, art has a distinct advantage where it can engage you intellectually and emotionally. It is not just another piece of paper in which you have invested but has the potential to enrich your life and affect the ambiance of your surroundings. online art gallery of My Indian Art. India is a land of rich art and culture. Since the ancient times, India has encountered many famous artists, who have contributed in building the nation’s heritage. In forms of visual arts like paintings on cave walls or textiles, to gradually painting on the paper and canvas, art has travelled a long way and still has to go further. However, preserving the art and cultural heritage of India is a very important factor to consider. And that is what an Indian art online gallery does. The initiative to build online Indian art gallery is a very wise decision that the art-conscious people have taken. This way, people who are interested in the Indian art and culture and want to express their vision and understanding of art, can portray their creations to the country and the world. As online is the new real, it is the best vehicle to reach out to maximum people. It is a difficult truth to accept, but the fact that one has to admit that the trend to go to the traditional brick and mortar art galleries and check out the works of the renowned as well as upcoming and promising artists, is dying. That is the reason, why many of the promising artists, who have the potential in them to do something worth contributing to the cultural richness is also obliterating day by day. However, with and Indian online art gallery, they will again get the scope to portray their creations to the people in their country and to the rest of the world. It is an amazing platform that will help the artists from the entire country to come out to lime light and showcase their works and creations. This is not only a platform for the artists to bring their works to notice of the art lovers, but also portraying the richness and depth of Indian art to the world market and hence, make it more acceptable and get the worth it deserves. Various exhibitions of finest repute take place in India every year. However, not all of them succeed to reach the art collectors. Therefore, creating awareness amongst them is a very important task that an online art gallery in India has the potential to do. An online art gallery is, to put into simple words, a website for a traditional art gallery. A good online art gallery will have its own team of experts, who have the knowledge and skill to recognise the arts that have the potential to create a revolution and leave its mark. They handpick these pieces of arts that can be anything from an oil painting or a landscape painting, a charcoal painting or even a water colour painting. When you visit an online art gallery in India, you will be introduced to the profile of the artist along with their resumes. If they are available for auction or sale or only for display purpose, all the details will be mentioned there. Each and every piece is original and is portrayed with their original details mentioned. 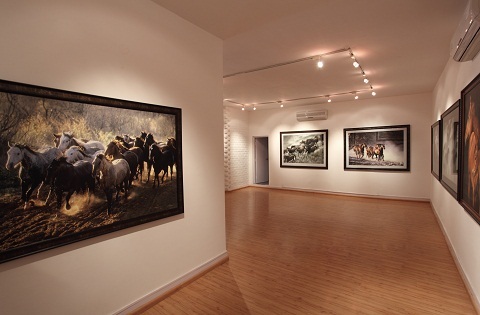 By categorising them according to the genre, subject, size, price as well as artist, the galleries make sure that you find the convenience to enjoy Indian art. It is truly an innovative step in the art and cultural life of India. The online Indian art galleries are a new step towards making the world a better receptor of Indian art and culture and building a platform for new artists to showcase their works. Art is nothing but a reflection of one’s true self. Although aesthetic tastes and requirements vary from person to person, still one of the main attractions that is found to be common in most of the art is an endeavor to find beauty in life. Indian contemporary artists who were who were restricted to Indian sub-continent only and disregarded by Western media made a way to reach Europe even before IT aspirants were seen to swarm in the United Kingdom. Over the years, Indian art has completely changed the typecast image of India into vibrant hues and caught the interest of thousands of art lovers. Nowadays, Indian contemporary art has started experiencing exceptional growth both ethnically and commercially, broadening the path for the art lovers to get a true tint of amazing artwork. Although Indian art has seen several transitional periods right from the ancient art of Mughal period to the art of post independence period, it has managed to grow without losing its unique factor and this is the main reason why Indian contemporary art has been able to touch the international level. Anup Giri: The art works he created speak of the facts that eyes can not get to perceive. He was seen to twit on his twitter page that. Sometimes the heart sees what is invisible to the eye..
Deepankar Majumdar: The paintings truly depict the mixture of aesthetic excellence and exquisite brilliance. Shekhar Ballari: The main two things the artist has tried to emphasize on are the art and the style of art. Shrikant W Kolhe: The artist is seen to believe in the fact that “Darkness is not the opposite of light; rather, it is the absence of light.” His paintings happen to take inspiration from this thought and have now become highly popular. Now, if you are looking for Indian contemporary art online, it’s time for you to heave a deep sigh of relief. With the running stride of time, numbers of online shops have popped up, presenting an excellent collection of a myriad of stunning art works. The art galleries are not only fraught with a striking amalgamation of beauty and splendor, but have also enabled to touch the satisfaction level of a plethora of art lovers. 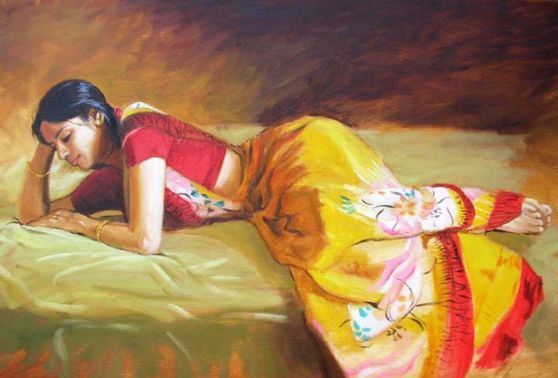 The paintings of Indian artists are now in high demand and if you are an art lover looking for art of exquisite stance, all you are required to do is browse through online, visit the store of the particular venture that you have found to be interesting and finally, opt for the art work that reaches your mind with a full sway. The rise of Modern Indian Art dates back to the times when India was under the British Raj. A time had come when the craft and techniques were just on the verge of extinction. Traditional paintings by Indian artists were losing their significance and the artisans were struggling to incorporate innovation in their creations. It was during this period that noted painters like Raja Ravi Varma of Kerela and Abanindranath Tagore of Bengal had come to the forefront. The former sincerely attempted to earn a name by taking up mythological subjects as his area of interest. The latter, on the other hand, was struggling to establish a style of his own, revealing nationalism in his work. Inspired by his attempts, others soon followed, leading to the establishment of the Bengal School toward the beginning of the 20th century. To say the word Romanticism is to say modern art – that is, intimacy, spirituality, colour, aspiration towards the infinite, expressed by every means available to the arts. – Charles Baudelaire. Inspirations, of course, remained the same; subjects revolved around mythology and the classics. Eminent people like Jamini Roy and Rabindranath Tagore came up to give folk art a modern touch and introduced the concept of expression. A lot was experimented with colours and techniques. Chinese styles were welcomed and the lost craft of miniatures and frescoes was revived. This was the baby step of Indian contemporary art back then, which has only seen a mammoth growth in today’s world. Visit any art gallery in Kolkata, today. You’ll observe how their influences have not only remained strong, but also continued to inspire artists of modern times. In the later years, artists like Amrita Shergill had successfully managed to merge the Western styles with Indian trends. She was the first lady to set foot in the world of modern Indian art and has set benchmarks for many. A large number of her works have been preserved by the National Gallery of Modern Art in New Delhi, and has been acknowledged by the Government as National Art Treasures. 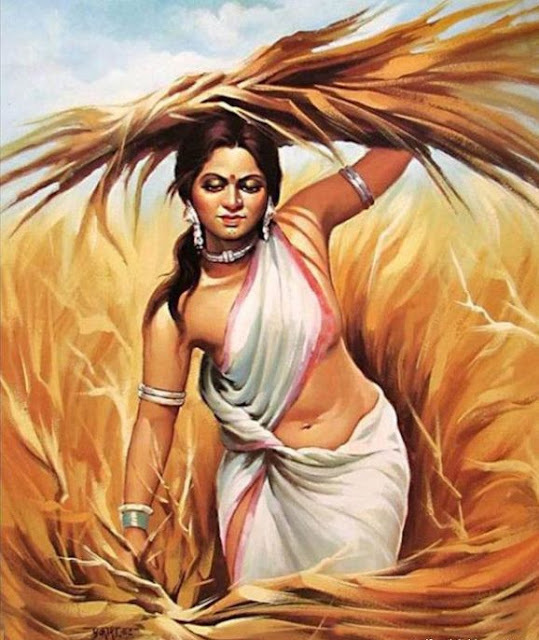 Indian contemporary original art of today, owes a lot to this lady. Cross-over and mixing have become mainstream today. Foreign collaborations are common and the blend, in fact, is interesting, eye-catching. Amalgamation of culture is being encouraged more and more, fresh ideas are popping in, and the style is going global. The concept of surrealism has found its way into the style. Trends no longer bother artists; sharing of cultural differences and similarities does. Yes, the Internet is playing a huge role in promoting the popularity of the art form. You can now buy Indian art online. Galleries have hopped on from the physical world to the big web. Pick up any website that lets you buy Indian original art. The array that you perceive shall be wide and vibrant. Browse through sites like MyIndianArt.com. You’ll be received with a plethora of paintings and modern art designs that, each better than the other. Indian contemporary art forms that you see today, have actually branched out from the paintings of cave men. Know more about the magnificence of these early precursors and how they still manage to woo artists of modern times. Why did the early man take to painting and when? What prompted him to conjure up colours? Was it a mere desire to depict the vistas he has perceived, or was it something else? Even though we can never get the hang of why and how the craft started, we now know how he had made use of his cave walls as his canvas and every earthly element possible as his tools. And, it gave birth to the amazing art, eventually. How Could the Mystical Land of India Escape the Trend? Prehistory has witnessed the growth of fine Indian artists who have availed themselves to the rock media. The most pronounced examples can be found in the Ajanta and Ellora caves where the murals stand to this day. Other evidences include the paintings of the Bagh caves and those in the Sittanavasal monastery. Of course, the geography of the land and the diversity of cultures were two huge factors that had encouraged the art to flourish in the country. An interesting fact here is, the paintings have been amazingly preserved over time, although such creations are often believed to be short-lived. The Art had then Travelled Down from Prehistory to Ancient and Medieval Times. If you travel to every nook and corner of the country, you are sure to find thousands of little caves and rock shelters that still depict the prehistoric paintings that were carved on their walls. Some of these creations are as old as 30,000 years, or perhaps even more. From the mighty Himalayas to the coastline of Tamil Nadu, you will discover that the trend had spread all over the land of that time. Mentioned below are some of the places, where the craft initiated by the early man influenced people to carry forward the legacy in its purest form. Almost in a dilapidated state now, the Ezhuthola cave paintings are perhaps the most beautiful creations of the prehistoric times. The cave is located in the Marayur-Chinnar forest belt of Kerala and contains twenty-one amazing depictions in red ochre. Although they still stay away from the interest of researchers, the Ezhuthola paintings, mostly speak about life during the prehistoric times, with humans and animals being the prime subjects. The cave is a home to some of the most exquisite paintings of the first century BC. The creations are clear hints toward the first ever, planned attempt to beautify the premises of a land. There are depictions on the walls and ceilings and they have been created in two layers. Line drawings are very prominent, along with the use of red, black, yellow and white colours. A red outline, in fact, is very typical of these drawings. There are human figures, fishes, elephants, flowers, birds, and chariots painted everywhere. However, they speak nothing about religion. Located in the district of Aurangabad in Maharashtra, these creations date back to the ancient period of Mahayana Buddhism. If you study them closely, you will notice how they focus primarily on the life and teachings of Gautam Buddha. Depiction of mythical characters is common. So, you will see a lot of goddesses, Nagas, Yakshas, Vrikshikas, and other beings who were integral parts of that era’s supernatural essence. Cave 10 of the entire lot, has the oldest Indian paintings created around the first century BC. The creations are unique. They are frescoes done on mud plaster and with earth colours. You will find them practically everywhere – on the walls and even on ceilings, speaking about the life of that period in the court, for feasts and celebrations, for men and women, of festivals, and of flora and fauna, too. The most important aspect of these paintings is that, the artists of those times had made use of shading techniques to impart a three-dimensional effect, which is a huge advancement of the art. Although the paintings were present in five of the caves of Ellora, only the ones present in the Kailasa temple could be successfully preserved. The most intriguing thing about the mural paintings of Ellora is, there were not completed in one go, and were carried out in two series. The initial round was during the carving of the caves and the final round happened centuries later. The drawings depict very discrete features of pointed noses and sharp, sturdy figures. Prominent, protruding eyes, a typical facial characteristic of the people of Gujarat, was first seen in these creations within the caves of Ellora. This is a big evidence about the inter-regional influences that were dominating in that era. The latter series portrays a lot of Shaivism, which indicates that years later, the influence of religion was full-on. Situated on the banks of River Bagh in Madhya Pradesh is a group of nine rock-cut caves, together known as the Bagh caves. Within the sturdy walls are present, some stupendous paintings that date back to the period between the fifth and seventh century. Interestingly, the medium, which has been used to create them, is tempera, something very unusual in that era. The drawings have been prepared on a reddish-brown mud plaster applied to the walls and ceilings. This plaster has been primed with lime and the creations executed on them. Buddhism has been a big influence for the artists of that era. The Sittanavasal caves are located in the Pudukottai district of Tamil Nadu. These creations in the walls are very similar to those present in Ajanta, and are believed to be a link between them and the Chola illustrations of Thanjavur. They also show the deep impact of the ninth century Pandyan period. The themes are mostly of animals, birds, lotuses and dancing human figures. The drawings have been composed mostly with the colour white, which has been prepared from lime. Other colours include black, prepared from wood charcoal, red from red ochre, yellow from yellow ochre, blue from Lapis Lazuli stones, and olive-green from terre verte (earth green). These drawings have been very recently discovered, and are believed to be 10,000 years old, hinting that they belong to the prehistoric era. The creations are done using natural earth colours and have astonishingly remained intact all these centuries. The carvings are strange, and depict human-like figures with weapon-like things in their hands. Eerily, these figures lack a nose and mouth. Scientists strongly believe that the depiction is about aliens because some of the drawings show the figures wearing dresses that resemble space suits. If all these claims come true, this is going to be a groundbreaking discovery, which will give us an insight into the connection of prehistoric men with life from beyond the Earth. Prehistoric paintings are in fact, an alternative trend to the contemporary creations of today. What is new is actually a revival of the old that has flourished with the inspiration of ancient ideas. Take up any Indian art gallery online, and you will see how ‘abstraction’ is a huge aspect of the beautiful paintings of today. In addition, there are colours that are superimposed and non-representational – prehistoric styles in every way. The relation between the two forms of two different periods of time is, indeed, very dynamic. And, the evolution is still on. May be the purposes have changed. But, the wish to create masterpieces, still remains the same.